Two weeks ago we looked at the US and UK editions of James Frey's Bright Shiny Morning. "Is that real neon on the UK cover?" was quickly answered by designer Jon Gray, who wrote in to say: "The type was drawn up first and then taken to a sign store and made up. The whole sign is about A2 size, so there are some incredibly intricate turns in there. A truly amazing skill." 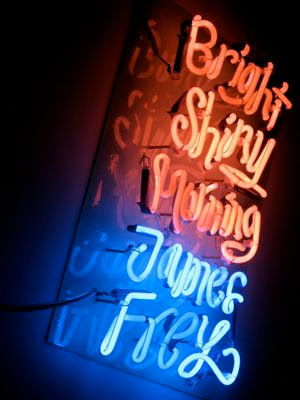 Last night, James Spackman (the sales & marketing director of John Murray, Frey's UK publisher) pointed me in the direction of Frey's Web site and to this photo of the neon sign "(which) hangs in our office, casting a splendidly seedy glow all around..."
I read a review of the book somewhere (presumably the US edition) and it called the writing "neon" or something, which made me think the reviewer had cheated and looked at the UK cover. It's wonderful of the designers to put so much effort into making an amazing cover. Am I the only one who is reminded of the title "A Bright Shining Lie?" Which, given Frey's - ahem - history, seems rather amusing. Spackman's call regarding the splendid seediness of the title (and its promotion) was perhaps more ironic than he intended. Thanks James Spackman for the laugh.